Page Length: 79 Pages, largely made up of pictures and some sentences about them. Suggested age range: 3rd grade up. Reading difficulty should not be a problem. Statuary shown in the Theater and gods section may concern some parents but 99% sanitized otherwise. This will be a quickie, but what can I say about this series that hasn?t already been said? While the content of each I think parents should look through before handing them to their children, by and large the subjects are safe for all ages and are very educational. Any areas they get wrong tend to be areas most educators get wrong at the time of writing. 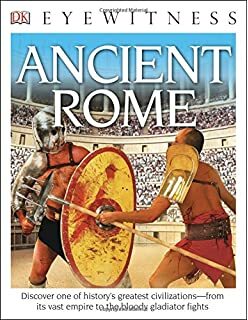 In this case, Ancient Rome, one of the Greatest Empires in human history. Each page and in some cases 2 pages, covers a particular facet of it. There will be one large paragraph or two but the most of the page will be covered in pictures. Each picture will either be a piece of artwork, and recovered artifact or a recreation of something of the period, and a small sentence or two explaining it. Subjects are far ranging from soldier?s gear, gladiator games, growing up as a child, life of an adult man, life of an adult woman, clothing, jewelry, Gods, Theater, and so on. When it come to Theater and Gods, parents may find some areas young readers may not want to see as ancient Greeks and Romans loved depictions of the Human body in its naked Glory, but you can easily mark those pages with sticky notes or wait until the child is old enough to start learning about the Romans. Your kids are your kids, and frankly here in the United States of America we don't seem to have the same horror as axs going into skulls as we do with kinkier stuff, gladiators and soldiers and all, but overal the imagry is rather tame (nothing from Pomeii here if you know what I mean). While this will be something parents will have to decide, I?d go with a go get it rating. It?s a fun, educational romp through one of histories greatest empires, and something that might help in that essay in 6th and 7th graders have to type up when they cover this culture. As Mentioned at the top a reading level, said Reading level is very easy, maybe first couple of grade levels, and at 79 pages of mostly pictures. Even if someone is a struggling reader, there will be plenty of pictures to keep them interested while YOU help them along. If you like this, or even if you don?t, I would recommend the others in the Eye Witness series. They have stuff on just about every conceivable subject, from both world wars, dog breeds, knights and armor, crystals, motorcycles, gorillas, volcanoes, rain forests, the human body, and so on and so on. Next time something not so child friendly but just as educational.